This page is about snow leopard cubs and the wider topic of reproduction and development. The sources are Wildcats of the World (the No.1 reference work on wildcats) and as mentioned in the text. The habitat of the snow leopard is harsh and high above sea level. This means very cold winters during which there are limited prey opportunities. This would indicate that the time during which the snow leopard gives birth is restricted to the months when food is more readily available. This, in fact, is the case. The difference between the snow leopard and common leopard is stark in this respect. In captivity the birth months of the common leopard are fairly even with a slight peak in March, while the snow leopard peaks markedly in May and the other months are almost totally rejected as birth months, except for some activity April June and July. Estrus (the period during which the female is sexually active), which is thought to last for between 2-12 days, peaks in late February. During this time she makes loud meows at night, which can be heard by the local shepherds. On this basis, it is thought that snow leopards in Ladakh (see map below) mate during late March to April and in Nepal during March. The narrow window during which the female is sexually active and the fact that all females are in estrus at the same time means that the male snow leopard cannot successfully inseminate a number females due to male competition, which in turn precludes the need for a male home range that is large and exclusive and which overlaps that of several females. As a result the male home range overlaps more than usual with that of other males. Gestation (the period of pregnancy) is 94-103 days. Litter size is 1-5 snow leopard cubs. The average litter size is 2.2 snow leopard cubs. Cubs are 7 days old Eyes open. First week of a cubs life Mother spends almost all her time with the cubs. First few weeks Cubs gain weight at 3-500 grams per week. At 5 weeks they weigh about 2.5-3 kg. 5 weeks of age Cubs walk upright and start to eat solids. Mother leaves den more often. 10 weeks Cubs are weaned and weigh 6-6.5 kg. Probably about 2-4 months Cubs beginning to follow their mother out of the den. 2-6 months Cubs begin to learn to hunt. A lot of this is play while the mother does the difficult stuff! 2-3 years of age Cubs become sexually mature. About 4 years of age Adult female gives birth to her first litter. Adult male as a father is of similar age. In captivity at 21 years (src:The Snow Leopard Trust) Snow leopard can live to this age. In the wild it is more likely to be 10-13 years3. In general, as for other large wild cats the cubs are dependent on their mother for a considerable time. And this means that the demands on the mother to hunt and kill prey are doubled when the cubs are at 2-6 months of age. This in turn demands a good local supply of prey. Or in the name of hunting efficiency it can translate to killing farmers’ livestock causing the inevitable human/wild cat conflict to, ultimately, the cat’s detriment. A danger that is ever present in either small wild cat populations and/or fragmented or “island” populations is inbreeding depression. As the snow leopard lives on mountain ranges divided by massive plains there is the potential for isolation but this seems to be avoided by adventurous males travelling long distances (up to about 600 kilometres) over unsuitable terrain to find their home range. and contains sequences of mother with cub. 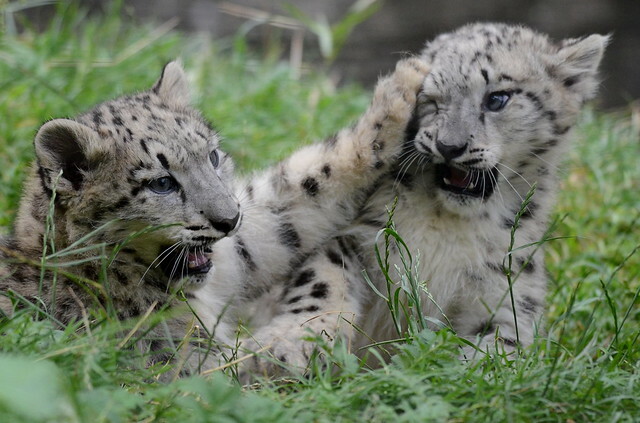 From Snow Leopard Cubs to Home Page. This page was built using Google Docs. You can see the document here (new window). These events would seem to relate to captive snow leopard studies. photo by guppiecat published under a Attribution-NonCommercial-NoDerivs creative commons License — this site is for charitable purposes in funding cat rescue. This entry was posted in Snow leopard, Wild Cat Species and tagged snow leopard by Michael Broad. Bookmark the permalink.